With the mindset of “love what you do AND/OR do what you love” honestly and truly it took me awhile to come up with something. But, a ha! Found one. Checking the PSI on the tires. It’s boring, my fingers get dirty and half the time when I remember to do it I am dressed up. I’ve got to admit that taking care of the vehicles was always seen to me as a “mans job”. Having been chauffeur, with his vehicle, to my Dad before his passing I stepped into one of the biggest values he taught us; WHATEVER you have, regardless of its value, take the best possible care of it. So in honor of my Dad and in gratitude for all that I have, I maintain regular check ups. I also have to admit that of this journey to single-dom, I learned very quickly of borderless household jobs and responsibility. When a main sewer backs up, a broken window, heat-less furnace appears, there is no tomorrow. In having my little pity party (which I do allow if they are few and short in between) and “why me” and “damn you”, there is just today and right now! Experts agree that keeping the correct air pressure in your tires is as important as giving your engine a tune-up. In fact, the economic benefits may be even greater. With the right amount of air pressure, your tires wear longer, save fuel, enhance handling, and prevent accidents. Failure to maintain the correct air pressure can result in poor gas mileage, reduce tire life, affect vehicle handling, and cause vehicle overloading. 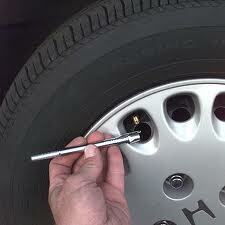 If you consider these factors, then the need to routinely check your tire pressure is even clearer. In constantly using the analogy of our bodies to our vehicles, don’t wait until disaster in the form of dis-ease diagnosis happens. Pay attention to your PSI! Just like you can easily get a gauge to help you for your tire health, you can easily get the tools for your health. Previous PostWhat Where WhenNext PostDid anyone ever die from back pain?